The 100th (Prince of Wales') Royal Canadian Regiment of Foot was raised in Canada in 1858, in response to the Indian Mutiny of 1857. In 1875, the 100th became the recognised successor of a previous 100th Regiment of Foot, which had been raised in Ireland in 1804 and disbanded in 1818, after 13 years service in Canada. On 1 July 1881, the 100th (Prince of Wales' Royal Canadian) Regiment of Foot merged with The 109th (Bombay Infantry) Regiment to form the First Battalion of The Prince of Wales' Leinster Regiment (Royal Canadians). The 109th became the Second Battalion. The Prince of Wales' Leinster Regiment (Royal Canadians) was disbanded in April 1922, following the creation of the Irish Republic. 13 Oct 1863 The 100th embarked at Gibraltar and relieved the 4th Rifle Brigade in Malta on 17 October. The move was very unpopular as the regiment replaced the monotony of garrison duty on the Rock, with a similar one on a small island. Rowing occupied much of the surplus energy of the Royal Canadians. It had an average strength of 167 men, 180 hospital admissions (1077.8 admissions per 1000 of mean strength) with 1 death out of hospital (5.99 deaths per 1000 of mean strength). The regiment had its HQ at Fort Ricasoli, with two coys at San Salvatore and one coy at Zabbar Gate. A few married families of the 100th Regiment were at Pembroke camp. In 1864, the regiment had an average strength of 771 men, 929 hospital admissions (1205 admissions per 1000 of mean strength) with 3 deaths in hospital and 1 out of hospital (5.19 deaths per 1000 of mean strength). Oct 1864 Death of Captain James Lamb. He had been promoted from Sgt-Major to ensign in the 50th Foot for bravery in the field. He had served at Alma and Inkerman and throughout the whole siege of Sevastopol. 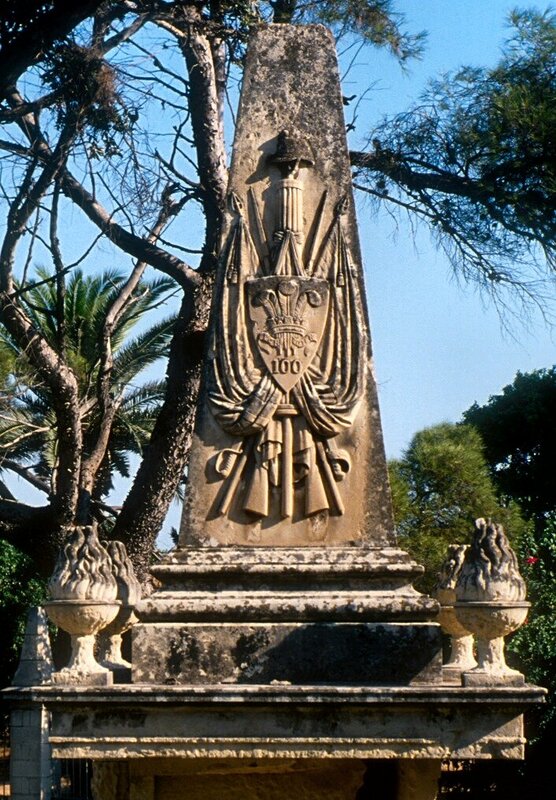 The obelisk at Ta' Braxia Cemetery was relocated from outside the cemetery near Floriana. It commemorates the dead of the cholera epidemic of 1865. In 1865, the 100th (Prince of Wales' Royal Canadians) Regiment had an average strength of 719 men. There were 879 hospital admissions (1222 admissions per 1000 of mean strength) with 21 deaths in hospital (29.20 deaths per 1000 of mean strength). The men were at Lower St Elmo Barracks (642 men) with a detachment on the Crown Work of Floriana (21 men). Lower St Elmo Barracks was situated in a deep sunken area, contiguous to one of the lowest levels in Valletta, a few feet above the sea. It was surrounded on all sides by an amphitheatre of high walls which excluded ventilation. Although originally construed as a temporary refuge during a siege, it had been converted into a permanent barracks. The military prison was within Lower St Elmo Barracks. The chief warder, his wife and three children occupied a few small low roofed rooms at one end of the prison. The privy being situated in a little cell near the kitchen door. On 20 July one of the girls fell ill with cholera. She was nursed by her sister residing at Floriana, who likewise contracted the disease on 21 July. Her mother and another daughter became sick on 25 July. The prison chaplain who had been in constant attendance upon the suffers was attacked on the 24th. Within Lower St Elmo during the last 12 days of July, there were no less than 19 cases of cholera with 15 deaths. In August the regiment had 7 sick with 4 deaths; in September 1 ill with 0 deaths; in October 1 ill with 0 deaths. During the cholera of 1865, the 100th Regiment had the highest proportion of cases and deaths: 22 NCOs and men (18 deaths), 4 women (3 deaths) and 4 children (2 deaths). The epidemic burnt itself out on 3 November 1865 when no deaths were recorded. 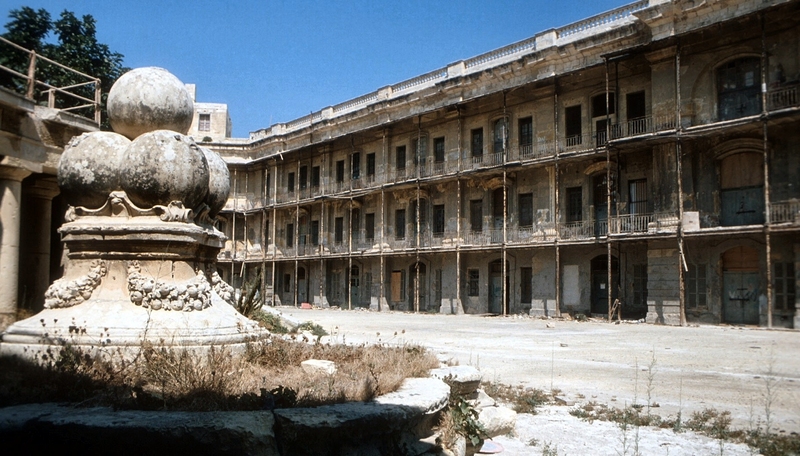 The deaths occurred at Fort St Elmo (11†), Horn Works (1†), Valletta Hospital (2†), Encampment Fort Manoel (4†), St Michael Counter Guard (1†), Crown Work (1†) and Pembroke Camp (1†). In 1866, the regiment had an average strength of 509 men. There were 568 hospital admissions (1115.9 admissions per 1000 of mean strength) with 4 deaths in hospital and 2 out of hospital (11.79 deaths per 1000 of mean strength). It had 142 admissions (279/1000 mean strength) for continued fevers with 2 deaths (3.93 deaths/1000 mean strength). 19 Mar 1866 The regiment moved from Lower St Elmo Barracks to Fort Verdala Barracks, with about 45 men detached at St Clement's Retrenchment. The great bulk of the married men were quartered at St Nicholas Curtain. Strength: 25 officers, 54 sergeants, 36 corporals, 20 drummers, 558 men, 60 women and 89 children. 25 Mar The first soldier with what Surgeon J. S. Chartres termed Verdala endemic fever reported sick on 25 March. From 31 March to 27 April 1866, there were 41 cases of fever in the 100th Regiment at Fort Verdala. Of these, 32 had previously suffered from ague and intermittent fevers in Canada. The youngest attacked was 19 years and the oldest 37 years. The total number of cases treated up to end of September was 108, exclusive of officers women and children. The first group of men reporting sick, had served continuously for over seven years in the Mediterranean, two years and a half of which had been in Malta. The disease presented as a hardly observable febrile dyspepsia with general malaise, considerable prostration and profuse sweating. It was marked by typhoid symptoms, which at times made it difficult to distinguish it from true typhoid or enteric affection. The men had a fatigued appearance with a puzzled or knocked down facial expression. The course of gastric remittent fever was very much prolonged and its progress slow, tedious and almost monotonous. Sequela were troublesome and painful with neuralgia, rheumatism, orchitis, swelling of the joints especially the knee joint, wandering shooting pains at night and oedema of the feet and ankles. Men were so disabled from their pain in and around the hip joint, that they had to use crutches to move around; orchitis followed resolution of the hip pain. Private M. Dillon fell ill with Verdala endemic fever on 13 April, was admitted into hospital on 19 April and died on 7 May, 22 days after its onset. A post mortem examination was unremarkable other than an enlarge spleen and liver. On 21 May 1866, Private James Purvis had been treated in his regimental hospital for Verdala endemic fever complicated with bronchitis and pneumonia. On 4 July, he was transferred to the Sanatorium Citta Vecchia where he died. A postmortem examination also showed an enlarged spleen. On 3 June 1866, a Lance Corporal of the band reported sick, stating that he was not feeling well. He looked fatigued but had no obvious signs of disease. The man lay in bed, became anaemic and wasted away daily with exacerbations of fever followed by profuse perspiration. In July, he was admitted to the sanatorium at Citta Vecchia. Milk as a rule was found to have been a valuable article of food and agreed with the great majority of those who had it. Patients, however, after a few days began to tire of it when it was omitted for a time, and replaced by beef tea. 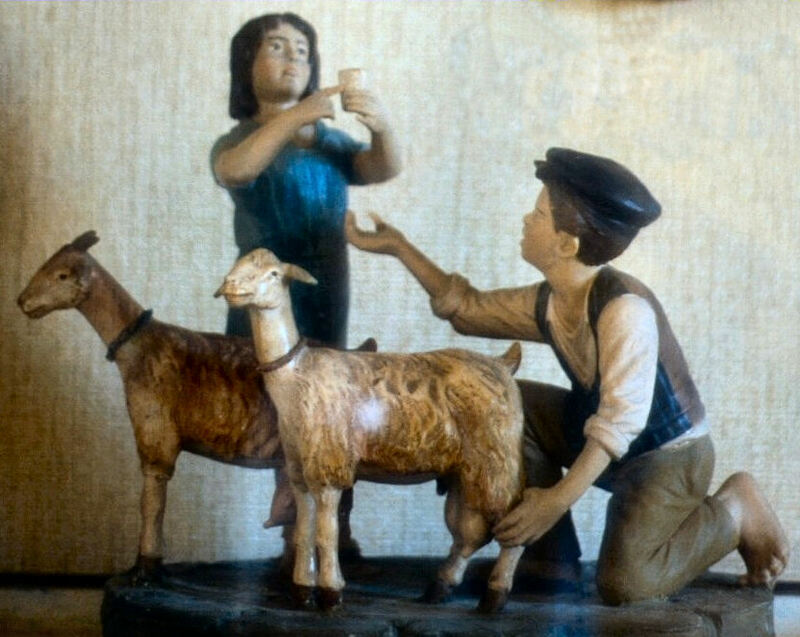 Verdala endemic fever, or Gastric remittent fever had all the hall marks of an infection with Brucella melitensis or Brucellosis. At the time the malady was attributed to defective drainage and poor ventilation of barrack rooms. 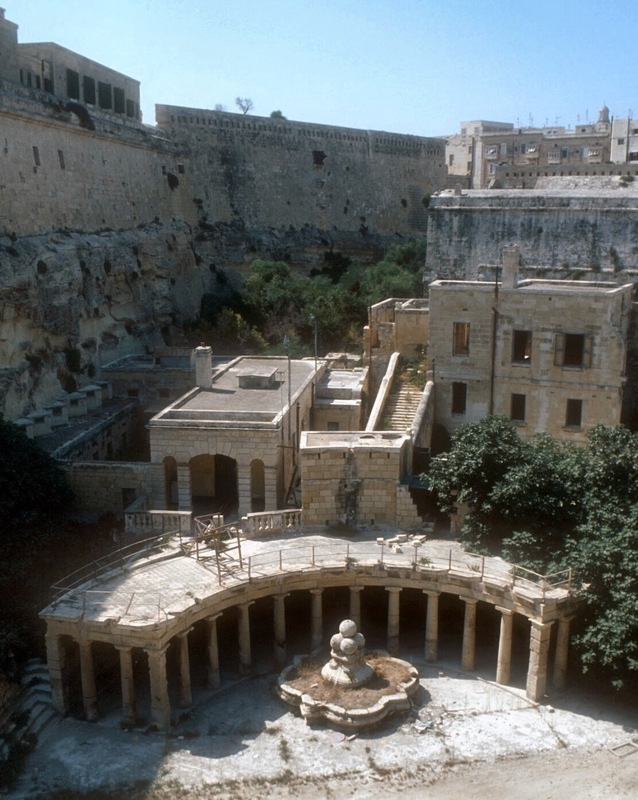 The drains were cut out of the porous, soft Maltese limestone which became saturated with sewage. Noxious gases seeped out of the drains and infected soldiers sleeping in overcrowded rooms. On 5 June 1866, tents were pitched for the entire regiment to sleep in by night. This measure was said to have brought the fever to a halt. 15 Oct 1866 The 100th was relieved by the 1st/24th Foot. It embarked for Canada on the hired transport Pennsylvania. 9 Nov 1894 The 2nd/Leinster Regiment left Aldershot for Southampton and embarked for Malta on the transport Victoria. It disembarked in Valletta on 18 November. The 2nd/Leinster Regiment relieved the 2nd/Royal Irish Rifles which left for India. The 2nd/Leinster Regiment had an average strength of 63 men. It had 159 admissions (2523/1000 mean strength) into hospital. 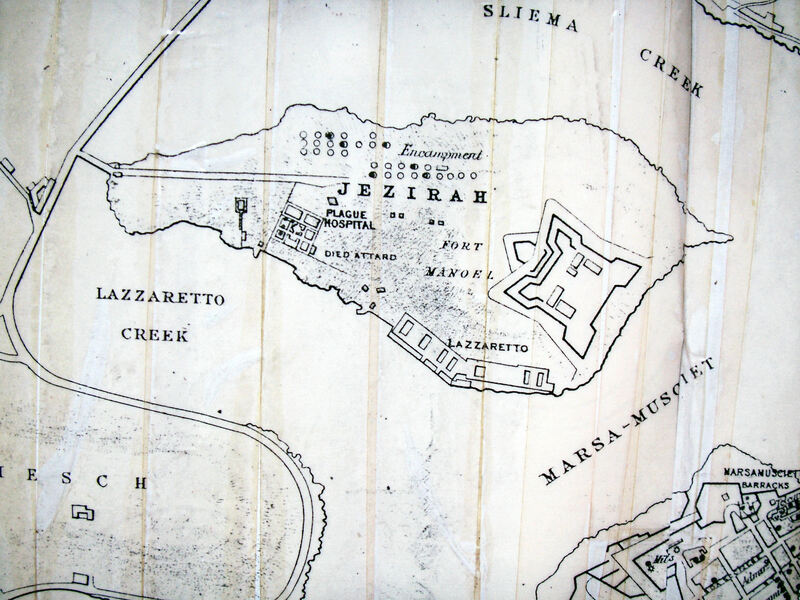 The Regiment was at Fort Chambray Gozo for 2 months. The 2nd/Leinster Regiment had an average strength of 869 men. It had 985 admissions (1145.3/1000 mean strength) into hospital with 10 deaths (11.63/1000 mean strength). 31 invalids returned to England. Its average constantly sick was 65.28 (75.91/1000 mean strength). The average sick time to each soldier was 27.71 days. The average duration of cases of sickness was 24.10 days. It was quartered at Fort Chambray Gozo for 11 months. Most of the 112 admissions for malarial fever during the year came from the Leinster Regiment, which had received a large draft from India in January. 14 Nov 1895 The 2nd/Leinster Regiment embarked for Bermuda. 27 Jan Eileen Murray born 23 Jan 1895, daughter of Ellen and CSgt George Murray of Gozo. 1 July James Edward Duffield born 30 June 1895, son of Annie and Sgt Maj James Duffield of Gozo. 29 July Aubrey William Graham Martin born 11 July 1895, son of Isabele Charlotte Sophie Wilmot and Maj Herbert Martin of Gozo. 2 Sep Everard Hemsworth Usher born 16 Aug 1895, son of Eliza Jane and Sgt Vernard Usher of Gozo. 2 Sep Hilda Hoole born 19 Aug 1895, daughter of Mary Jane and Sgt John Thomas Hoole of Gozo. 29 Sep Alfred Keith Murray born 18 Sep 1895, son of Annie and Drum Maj Edwin Thomas Murray of Fort Chambray Gozo. 2 Nov Elizabeth Vickery born 30 Sep 1895, daughter of Elizabeth and Sgt Ernest Edward Vickery of Fort Chambray Gozo. The 2nd/Leinster Regiment left 16 men in Malta on its departure for Bermuda. 1Whitton Frederick Ernest The History of the Prince of Wales' Leinster Regiment (Royal Canadians). Gale and Polden, Aldershot, pp 75-81.